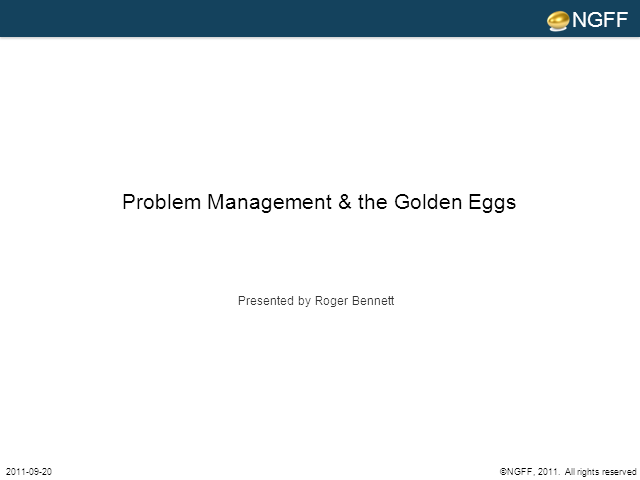 This presentation will share how you can use problem management to relieve the constraints in your systems. This will allow you to free up time and resources, while still improving your customer service. Roger Bennett is a lead consultant in ITIL, ISO, and best practice management. After 12 years running the IT for an adventure travel firm, Roger joined Reuters, earned an MBA and discovered ITIL. He is currently contracting independently for his own company NGFF Ltd.
Roger Bennett, Managing Director, NGFF Ltd. Presented by: Roger Bennett, Managing Director, NGFF Ltd.